My G-Uncle Harry was born on 22nd September 1897. He was my maternal grandmother's brother. 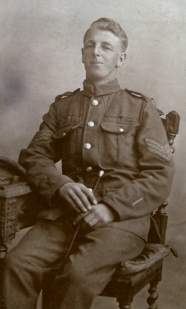 he joined up as a volunteer with the Gloucester Regiment 1915 as private 20193. Harry's dad was also called Harry - to read some stories written by Harry Civil Senior, click here. The statement below was submitted together with supporting witness statements by my great uncle, Harry Civil with the help of the British Legion in 1924. It is reported that the proposal to award him a VC for his actions could not be pursued due to the length of time which had elapsed since the event. I have added the map to the statement, which was taken from Harmsworth's Universal Encyclopedia Vol 1, published in 1922 . Statement by Henry Civil, ex Sergt.. “C” Coy, 12th Batt, Gloucester Regt., 95th Brigade, 5th Division. On the evening of May 7th 1917, we took over the front line trenches at Fresnoy to the right of Vimy Ridge, our portion being at the head of a salient, and as it had been raining previously our trenches were in a very muddy state. 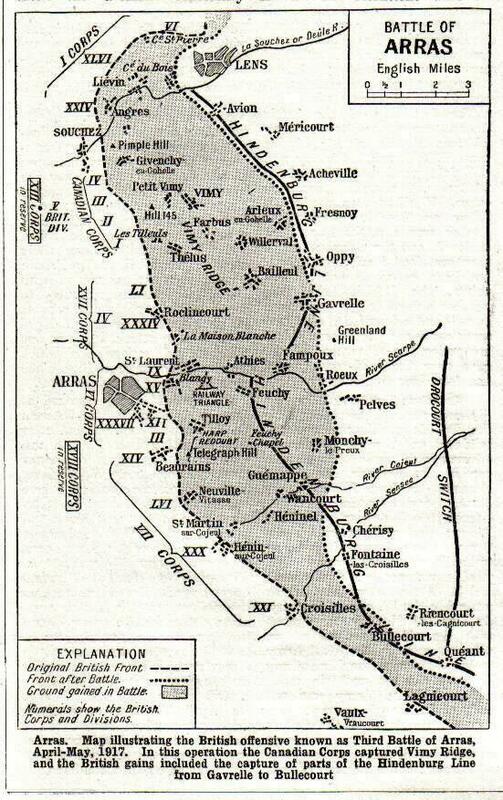 At dawn next morning, (May 8th) the Germans put up a terrific barrage, and we “stood by"(? difficult to read). Through the dim light we saw the enemy advancing in mass formation, and immediately as number 1. of my Lewis Gun section I opened fire. I kept firing and saw the Germans go down in crowds. I killed, I should estimate, at between 400 or 500. They were so thick that each bullet would go through perhaps three or four. They were in such mass formation, and so near that I could not miss them. Someone in rear was shouting “go back, quick, retire” and glancing quickly round I saw that I was left alone. I strained my eyes as far as I could see to my front (through the dim light I could see about 80 or 100 yards) and beyond the piles of dead could only see a few Germans running back at whom I fired off the remaining few rounds left in my pan, and replaced with a full one (being about the sixth) and I resolved to hand on as I guessed it was probable the enemy would come on again after re-assembling. It was not long before they did re-advance; they seemed to come from a trench about 100 yards away. I took aim and pressed the trigger but my gun jammed after a few rounds. Bullets were hitting up the ground all around me, splashing with a sting the mud into my eyes, face, ears and hands. The enemy came on to the accompaniment of hooters, whistles, and loud shouts, and it was only when the foremost wave was on me, that I got my gun going again. I fired at them point blank, about four or five pans until there was nothing left alive along about 150 yards of my front. My gun jammed again, and it was steaming and very hot. Setting it right again I saw the enemy advancing along the two flanks. I opened fire on the extreme left and slowly traversed to my front, and diagonally from the right where there was a raised road running diagonally from the enemy lines to ours. The Germans were advancing in apparent column or route along this road so I took sight on the nearest position (? difficult to read) to our line and traversed slowly. I was able to take a very good aim and the Germans were silhouetted against the now lighter sky, and I was pleased to see my bullets take splendid effect as the enemy were mowed down. My gun ceased firing at last, and I found it had been damaged – a bullet or something had hit under the pan burring up the feeding arm. Something exploded just under the gun (probably a hand grenade) and the force of the explosion combined with the none too firm foothold I was flung back into the trench. I staggered to my feet and again made sure that my gun was absolutely useless. There was no sign of life along my front, the piles of dead were enormous, and of course I knew the trench was still ours. I resolved that the next best thing would be to go back and gather together any straggler and man this trench that had not been lost. On my way back I found only the dying and dead. One poor fellow badly wounded came to me asking for water. Even as he asked a bullet took him through the throat and he died almost in my arms. I stumbled on (it was hard going through the thick mud and I was fairly exhausted) until I came to a sunken road where there were a number of stragglers gathered together. They consisted of different Regiments (about 100 in number) .. I pulled out a handkerchief and tore it into strups (? strips) giving some men a portion with which to clean the mud from the bolts of their rifles. I conveyed the message that the Germans did not have a trench whereupon I led the way forward again. But by then time had elapsed and the enemy must have got forward, took up position in our old trench, and one by one we were sniped off. It ended that our counter-attack was a “wash-out” and as far as I know I was the only unwounded who returned to our reserve trenches where there were the remnants of the Battalion who were eventually relieved. A few days later the Batt: c.o. Col: R.I. Rawson sent for me to give an account of going forward with counter-attack and details of what was done with Lewis Gun. From the reserve trenches they had heard my gun going and also knew that I had done effective work as no doubt aero photographs could prove. In the course of a few weeks I was promoted to U/Sgt afterwards Sergeant and eventually was given a Certificate of Honour bearing date of this May 8th engagement and a previous engagement of April 13th/18th, 1917. It gave notice that, a record was kept and entered in Regtl orders. I understood that I was again recommended this time for the D.C.M. in April 18th engagement 1918 but as usual heard nothing. I declare the above absolutely true in every detail as far as I can remember. 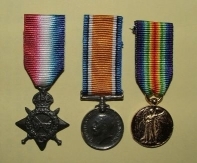 Harry was awarded the Victory medal, the British medal and the Star Medal for his WWI service. The entry for 'Fresnoy' in Harmsworth's Encyclopedia (1922) says " ... (Fresnoy was) .. captured by the 1st Canadian division, May 3rd 1917, it was retaken by the Germans on May 8th, and finally regained by the British October 6th 1918". 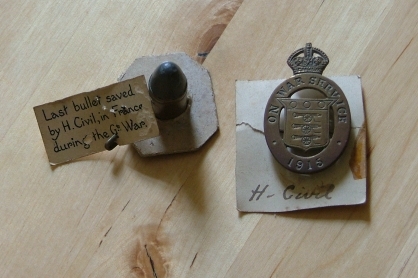 Harry's Service Badge and the 'last bullet from France' which he saved and gave to his Dad. Embroidered card sent by Harry from France to his sister Nellie.